LAHORE: An International Conference on “World Trends in Freedom of Expression and Media Development: A Pakistani Perspective on UNESCO Report” was held in the Institute of Communication Studies (ICS), University of the Punjab. Norwegian Ambassador Tore Nedrebo, Swedish Ambassador Ingrid Johnson, Vice Chancellor Prof Dr Zakarya Zakir, ICS Director Dr Noshina Saleem, UNESCO Communications Consultant Camila Ferro, Oslo Metropolitan University Professor Dr Elizabeth Eide, senior journalists Mazhar Abbas and Wajahat Saeed Khan, and communication experts from North America, Norway, Afghanistan, Indonesia, Malaysia, Nepal and Bangladesh along with another 100 senior journalists and professors from all over the country participated in the conference organised in collaboration with UNESCO and the Higher Education Commission (HEC). The PU vice chancellor in his address said that to ensure freedom of expression we would have to ensure an action against violent groups. The Norwegian ambassador said that Pakistani media was considered as one of the freest and popular media in Asia. Sweden’s ambassador said that the law of access to information was very good and we were in favour of this law. He also said that violence and harassment of women through social media must be stopped. UNESCO communications consultant said freedom of media was essential and state TV must be provided with financial and administrative protection so that it does not only remain the government’s mouthpiece. She also said the session organised with the help of UNESCO in 112 countries around the world passed laws in favour of freedom of expression. 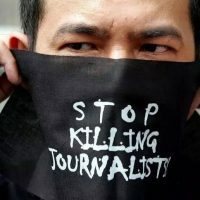 Oslo Metropolitan University Professor, Dr Elizabeth Eide said journalists performed their duties despite kidnapping and killings of their colleagues. “But a journalist facing threats cannot tell the whole truth,” he added. Mazhar Abbas said that the strength of the fourth pillar of the state was essential for the stability of the state itself. He said that if a journalist was harmed then the concerned media organisation must ensure that the journalist’s story never gets killed. Wajahat Saeed Khan said that journalism ethics were intended to convey the whole truth, but our conditions do not allow it. He said the business needs of the media were also a hurdle in the way of information’s dissemination. Prof Dr Abdul Siraj said that the norm of distributing plots among journalists and taking them to foreign tours must end to ensure dissemination of actual news. In the international conference, there were six parallel sessions for discussion on media freedom, media pluralism, media independence and safety of the journalists. There were also separate sessions for the presentation of research papers on these topics. Recommendations on the safety of journalists and ensuring freedom of expression were collected during the conference which would be presented in the form of a booklet later. Senior journalists and professors including Salman Ghani, Imran Khan, Sherin Zada, Prof Dr Hannan, Tanveer Shahzad, Dr Rashid Khan, Fahad Mehmood, Seemab Bukhari, Zulqarnain Tahir, Dr Anjum Zia, Ahmad Waleed, Azam Chaudhry, Dr Zafar Iqbal, Dr Sajjad Paracha and others also expressed their views during the conference. Another international conference titled “Working with and against the structures: Women, media and transnational perspective” would also be held at the ICS from February 28 to March 1.